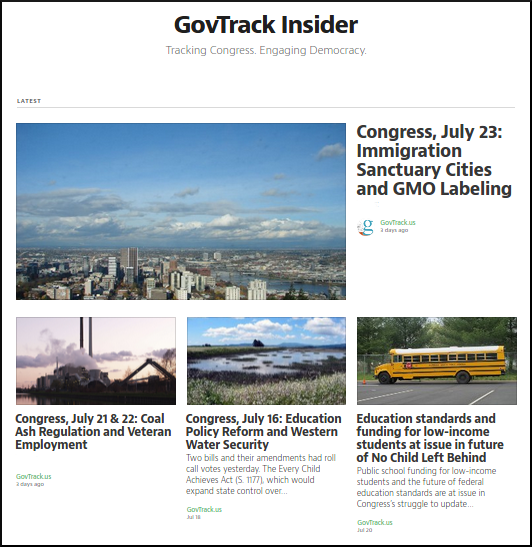 After running a summer-long experiment with intern Ben, we successfully funded the launch of GovTrack Insider, where we’ll be posting in-depth articles on bills in Congress and major Congressional activity. GovTrack Insider is made possible by the generous backers of our Kickstarter campaign that ended in early September, which raised more than $35,000! Thank you, backers! We’ve hired four part-time reporters to help us all track Congress, and they began just last week. Sign up to get our new posts by email, or head to the redesigned GovTrack homepage where you’ll see all of our latest posts. For the last year and a half we’ve been showing major bill events in a horizontal timeline with big icons representing the major steps. The new layout is vertical and has clearer links to related information such as vote details. Thanks to the work of volunteer Sergei Shevlyagin, votes can now be sorted by most supported, most opposed, and widest/narrowest margin. The list of votes now also displays vote summaries when we’ve written them. A new statistical analysis called Statistically Notable Votes, which picks out Members of Congress who voted in a statistically unpredictable way. Asterisks which denote voters that are likely to have voted strategically rather than by their actual beliefs, in order to help explain otherwise inexplicable actions. This currently includes when a party leader votes against their party in order to vote yes, which is a procedural method to gain the right to call for a second vote. The asterisk links to an explanation of what we think occurred. Votes on amendments now link to Congress.gov’s amendment details (since we don’t have amendment details here) and to the sponsor’s page on GovTrack. The layout of the page has been updated to be a little clearer. I have to apologize for messing up vote counts in some historical (prior to 1999) votes. From October 2014 through July 2015, we displayed incorrect vote totals for some historical votes. Although the total correctly reflected the announced positions of Members of Congress, the totals incorrectly included “paired” votes, which is when two Members of Congress, one planning to vote in favor and the other against, plan ahead of time to both abstain. The totals now omit paired votes and so now more closely reflect the official totals. Relatedly, in historical votes, when a Member of Congress changed party mid-session they may have been displayed with the wrong party in the vote and the party totals for the vote may have been incorrect. In so far as we have the data on mid-session party changes, these issues have now been fixed. When using our advanced search to search bill titles and text by keywords, bills that match in their title are now listed higher up in search results. That should make it easier to find the bills you’re looking for. The advanced search also has a new filter option for current status: “Enacted — Including via Companion Bills.” This is helpful when you’re looking at bills by a particular sponsor and want to know what bills that sponsor has enacted. Since bills are often introduced in identical pairs, one in the Senate and one in the House, but at most one can be enacted, a sponsor’s bill may have been “enacted” via a different bill that they are not officially the sponsor of. This filter includes in search results not only bills that were themselves enacted but also when they had a so-called companion bill that was enacted. The Library of Congress has updated their historical data on bills to apply current top-level subject area terms to historical bills, and we’ve updated our database with that information. 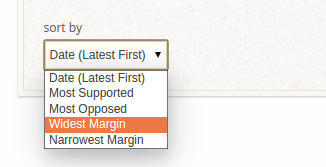 That means that when using our subject term pages to search for historical bills, you can see bills by subject back to the 93rd Congress (1973) rather than only back to the 111th Congress (2009). When tracking bills, when there’s a new cosponsor, the event details in your email update or RSS feed shows the new total number of cosponsors and the breakdown by party. The bill prognosis factors were tweaked a little bit to make it easier to understand the “show factors” details. The site loads a little faster now. If you have an account on GovTrack, the email/password update form works better now. 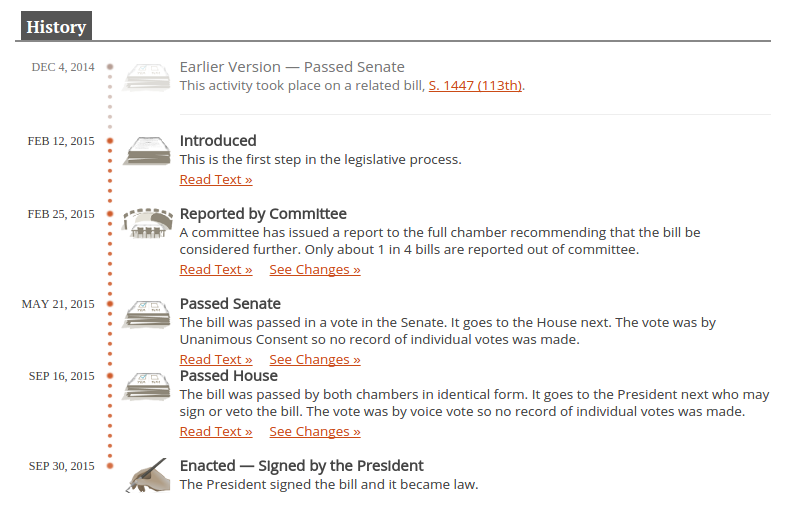 And as previously announced, we discontinued state-level legislative tracking.